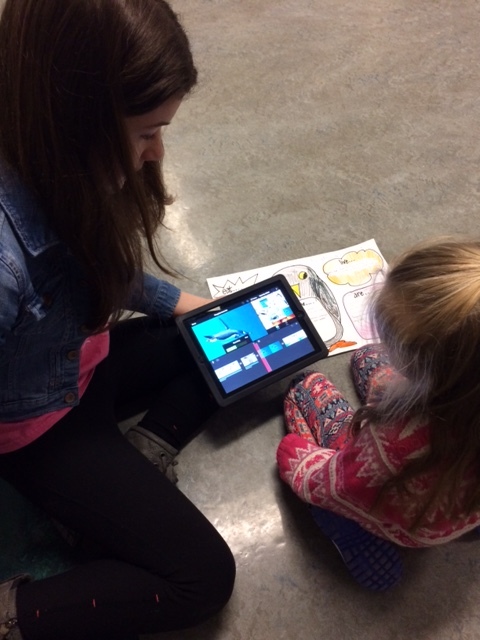 Each year we choose one digital literacy project for the Kindergarten, under the guidance of our West Vancouver District Support and Innovation (Technology) Teacher, Ms. Cari Wilson (@kayakcari). We have always completed these projects with the assistance of our Grade 7 Big Buddies. For the Kindergarten, it means we can raise the bar a little higher by creating a complex, multi-step assignment; and for the Grade 7 students, it’s an opportunity to mentor and be a positive role-model to younger students. Both grades benefit from a special connection across the years; the Grade 7s are also our recess and lunch monitors and help us out on the playground. This year, Mr. Russ Patterson is our Grade 7 Buddy Teacher. He teaches both Grade 7 classes during Buddy Time and meets with my class (Division 2 Big Buddies) and Christy’s class (Division 1 Big Buddies) in back to back blocks on Wednesday. Big Buddies are a vital part of Kindergarten Life. 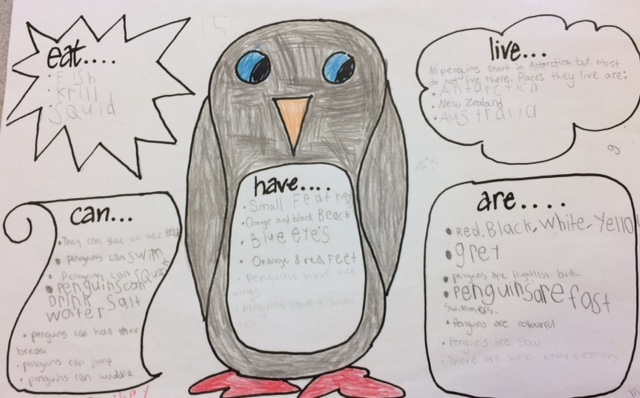 From the Kindergarten Science Big Idea “Plants and animals have observable features,” we decided to focus on animals (we’ll study Plants in Third Term) and we selected the beloved penguin as our animal of choice. A full-grown Emperor penguin is about the size of a Kindergarten child and for that reason alone, we’ve always had great affection for the penguin. 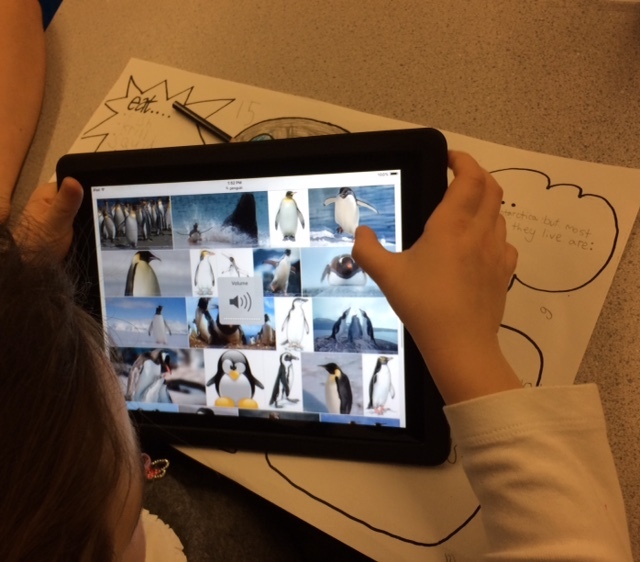 In the past few years we’ve used the app Book Creator on the iPad to create digital books about penguins, their habitat, young, appearance and food sources. Our Big Buddies would work with us to gather images from Google, write a brief descriptive sentence using a sentence frame and the Little Buddies would do a voiceover, reading the text aloud. This year we decided to take the same topic but use the app iMovie as our presentation platform. In her role as Technology Support Teacher, Cari also joined us on our first day of movie-making. 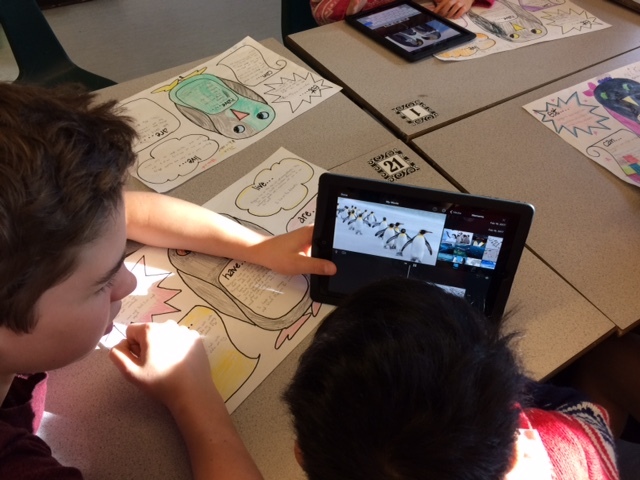 Our Penguin iMovies were a five week project. Christy and I completed a Mystery Box Inquiry before each Buddy class. The Mystery Box allowed us to teach questioning skills using the 5Ws in an interesting, game-like format and to introduce the penguins topics we were going to investigate. The Big and Little Buddies used this graphic organiser to record their research in specific categories. From pictures and text, students would read and discuss their findings; and all information was duly noted. The Buddies searched through Google Images to collect a minimum of three images for each fact. They would not necessarily use every image they found but they needed a bank of pictures to draw from for their movie. Each Buddy pair was assigned an iPad which they needed to use for the duration of the project. Each Buddy pair had specific criteria to fulfill: an opening image with a title; images of the specific topics (habitat, appearance, young, food); Kindergarten voiceover describing the images; end photo of the Buddies with Kindergarten voiceover naming the Buddies and credit to Google Images. This was a really fun project for our children. We love that they are using technology to create something, starting with the planning sheet to help organise thinking and then using it as a stepping off point to make an iMovie. We did have a few technical glitches, including iPads which refused to power on and movies which wouldn’t run. Fortunately, students demonstrated a can-do “the show must go on” attitude (grit and perseverance), pulled out another iPad…and started again. Ah…show biz. We’re going to premiere our iMovies at Student Led Conferences on April 20, 2017. Families will have an opportunity to sign-up for a Conference led by their Kindergarten child and viewing your child’s iMovie will be one of the Centres you’ll visit.